With Mr Spot Mysteries, you might just die... laughing! Meet the wacky cast of characters as you mingle during dinner. Observe the interactions. Ask questions. 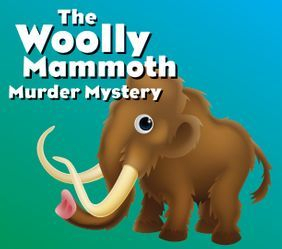 Watch for suspicious activity and be prepared for a tragic turn of events when…a murder is announced! Tragic? Not at all when you're dealing with these characters! 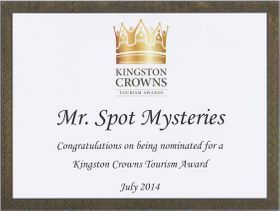 Mr Spot Mysteries is the only murder mystery nominated for a 2014 Kingston Crowns Tourism Award. Check out our Facebook page for great pictures of past performances. GIFT CERTIFICATES: Looking for a unique gift idea? Email details and we will send you a custom certificate with the recipient's name on it. SPECIAL EVENTS: Planning a staff party/sales conference/retirement dinner/birthday party/fundraiser? We can coordinate the entire evening for you in Kingston, or perform at your location. We've entertained guests at venues from Brockville to Brantford, and as far north as Calabogie. We can also write custom mysteries specific to your event, with a storyline geared to your company, organization or group.